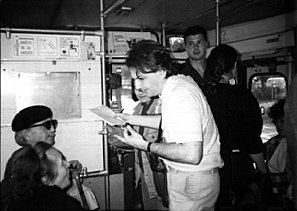 In a Novi Sad's city bus on May 13, 1992 I approached passengers posing them three simple questions: what is the first word they can remember, what do they like the best, and what they dislike the most. From those data I made an image of their minds and continued conversation with each of them. It was a time of war in the very close surrounding, so I wanted to listen to ordinary people, to hear their problems and offer them some good advise. I tried to make them think positively, even in the hard time of the economic and war crises.